Popular Temples in Karnataka - Karnataka is a place that has preserved the cultural heritage of the State and is blessed with natural beauty in many parts. Both domestic and international tourists visit to see this cultural heritage preserved in temple architecture. The predominant style of Karnataka Temples is the Dravidian art and sculpture. These ancient temples were built by the rulers of different dynasties who ruled this part of India. Chalukyas, Vijayanagar and Hoyasala are famous among them. Some of the best known temples in Karnataka were built by Hoysalas like Belur and Halebid temples. The outer and inner stone carvings and sculptures are intricate and beautiful, based on the images from Hindu epics. Anyone who enjoys the architectural beauty can really relax and take their own time going around the temples and marvelling at the splendid creations that stood the test of time. Some of the common features of Karnataka temples are the architectural elements, such as, garbhagrihas, lofty gopurams, large images of Nandi bull and the presiding deities made of black stone. Kollur Mookambika Temple - built among the hills of Kodachadri in the Western Ghats. Belur Temple - This Hoyasala temple is famous for its architectural beauty. Halebid Temple - Very close to Belur Temple, this Halebidu temple is also famous for its architectural work. Murudeshwara Temple - The idol of Lord Shiva of this temple is the 2nd tallest statue of Lord Shiva in the world. Udupi Srikrishna Temple - Located in Udupi, the temple is famous for its unique idol Lord Krishna which has its back to the entrance. Hence the devotees can see the idol from the back door and through a window. Virupaksha Temple, Hampi - Located on the banks of Tungabadra River, amongst the Hampi ruins, it is dedicated to Lord Shiva and one of the oldest temples of Karnataka. 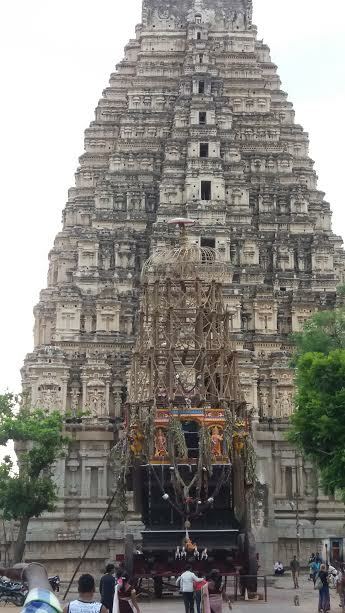 Kotilingeshwara Temple, Kolar where the largest and tallest Shivalinga is present. List of more temples can be seen here.